Home » News » GeoRepNet3: Geological Repositories. 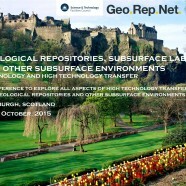 The STFC Network, GeoRepNet, will hold its third conference in Edinburgh from 12-14 October 2015 focusing on exploring all aspects of high technology transfer into geological repositories and other deep subsurface facilities and laboratories. The final programme of the October GeoRepNet meeting is now available here: GeoRepNet Meeting 3 programme. Registration is free and open until the end of this month (30th September) and posters are still being accepted. For more information and registration, visit the conference website.